A taste of success: Margaret Hearty, director of programmes and business services for InterTradeIreland joins Newtownabbey business woman, Anna Taggart, owner of Yummy Bakes NI, to encourage all micro-businesses across the province to take advantage of the Elevate programme which is now open for applications. Yummy Bakes NI credits the initiative, which is fully funded by InterTradeIreland, with helping to open up the Irish market for its high-quality pastry and biscuit ranges and is urging other small firms to benefit from this cross-border growth opportunity. For more information, visit www.intertradeireland.com/elevate. 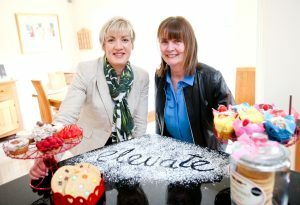 InterTradeIreland recently launched the next phase of its sales development programme, Elevate, which aims to help small businesses develop sales opportunities through first time cross-border exports. Through Elevate, InterTradeIreland provides sector-specific sales support across a range of areas, including food and beverage, construction, engineering and many others. In the past two years, the programme has already helped 150 small businesses, generating new cross-border sales of approximately £3million. One such company that benefitted from the Elevate Programme was micro-business, Yummy Bakes NI, based in Jordanstown, Newtownabbey. Owner, Anna Taggart, credits the InterTradeIreland programme with helping to open up the Irish market for her high-quality ‘golden moment’ pastry and biscuit ranges. Margaret Hearty, Director of Business Services & Programmes, adds: “We regularly review our available support for businesses and a few years ago realised there was a funding gap for small micro enterprises. As they make up 96% of businesses on the island, it is essential that they receive the support they require to expand and flourish. “The cross-border market is an often an underutilised but logical first step to wider export markets, giving experience of varied legislation and working with a different currency but has the comfort of being more accessible. Once mastered, this makes looking at European markets a more realistic prospect.